For many, welcoming a pet into the home is as joyous and significant as bringing home a new baby from the hospital. For many, welcoming a pet into the home is as joyous and significant as bringing home a new baby from the hospital. Pets easily find their way into our hearts with their playful antics and friendly companionship. When you decide you are ready for the responsibility of caring for a pet, it is imperative that you are willing to make adjustments to your living space. Preparing your home, pantry, and yard for your new pet is important to their well being and your ease of mind. This article offers pointers to those who are considering adopting a companion animal, or those who already have pets. Although the article focuses primarily on cats and dogs, many of the tips will work for most four legged friends. The tips may seem like common sense, but it may slip your mind to check for commonplace hazards when a new pet is underfoot exploring its' new surroundings. Many times we take for granted that things are safe or would be of no interest to animals. However, that adorable puppy running down the hall with toilet paper streaming behind him would beg to differ! When bringing a new pet home, the last thing anyone wants to think about is cleaning and proofing their home. However, taking a little time to do so will prevent headaches and possible heartaches. It will keep your pet, your prized possessions, and your sanity intact. This is true whether you are bringing home a new pet or adjusting an older one to a new home. Or, perhaps you find yourself in the unfortunate situation of losing possessions to a pet who has never had boundaries set up in the home. Whatever your reason, these tips will help proof your home for the new, old, and mischievous pets in your life. Get down on all fours and look around at the same level as your pet. There is a whole other world down at their viewpoint! Think low! Remove objects on low shelves, coffee tables, and anywhere else that is easy access. Anything destructible, such as paper, books, anything made of cloth (i.e. laundry). It is much easier to 'chew train' a pet if they do not learn a bad habit of "where to look" for destructible goodies when you aren't looking. Also think about food and snacks. Don't leave pop cans, candy wrappers, crumbs or anything else on a low counter. Leaving out these delicious tidbits can easily lead to "counter surfing". Since kittens and ferrets may actually have the ability to walk on your counters, make certain to keep an eye on them when cooking. You may have food on the counter and the stove burners on - both can be dangerous. If you are a messy chef you may have a very happy kitty, but it could be dangerous if you don't keep an eye on them! Speaking of food and snacks, make sure if you have smaller pets, like mice, that they are out of reach to your new puppy or kitten. Don't forget your fish - sometimes the idea that the aquarium is invincible can be tested. Smokers - do not leave cigarette butts where pets may reach them. If eaten it can lead to nicotine poisoning and the filters aren't good on the digestive system. Children's toys can be great fun for pets too! Make sure your kids realize they may loose their toy if it is left out and unattended. Also many toys may have small parts or can be easily broken into small parts by your pet which can be dangerous. Overall keep you place picked up of daily messes. For example: Newspaper whether read or not is still fun to shred and eat. (Same goes for the mail!) Just got home from shopping? Put away the bags! Plastic bags can be either chewed and swallowed (pups) or can suffocate some pets accidentally (kittens & ferrets). Sometimes pets will eat something that will require surgery to remove. Small objects to watch out for include rubber bands, balloons, beads, buttons, Q-tips, sewing needles, thread, staples, string, pantyhose and coins - to name a few! Medication should never be left around the house. Make sure it is secure - just like with children! Keep heating vents covered. Many pets love to snuggle up to these and you don't want your pet falling in. Smaller pets like ferrets should be blocked off from holes and other hideaways - you don't want them to find a comfy spot and not come out! Also be certain to check under recliners before moving them as your pet may find it a nice place to hide out. Plants should be moved to higher ground or blocked. Watch out for vine plants that your pet might grab and bring the whole thing down. * Some household plants are poisonous to pets. Here are a few: aloe verra, amaryllis, caladium, holly berries, lilies, mistletoe, mums, and poinsettias. For a complete listing check out the Poisonous Plants resource links. Unless they are sleeping, or eating, they are playing!! Some tips to make this non-stop action fun and safe for both of you! Keep an eye on your pet at play with certain toys. Some toys don't hold up to your pets hunting prowess and become shredded in no time. Toys with squeakers are fun but many pets will work hard to remove them if your not watching. Just keep in mind if you are in the other room, you may never see them devour their cut up prey! A solution would be have toys for when you can see them and more durable toys for when they are in the yard, other room, or you are not at home. Also watch older toys. If they don't fall apart they may actually be warn into sharp edges, don't let your pet play with damaged toys, they can cut themselves easily. Look before you step when playing with all our small pets. Try this pattern "Turn, Look, Step"
Some small animals such as rabbits are chewers and it normal to give them various chew toys such as: Cardboard boxes, empty oatmeal containers, bird toys, cardboard paper towel rolls, things to shred. Try to keep them away from your wooden furniture - they love wood! Instead wood sticks are available at pet stores. If they can't reach it, they can't eat it, scratch it, or all out destroy it! Don't forget the garbage! Take the garbage outside or make sure you can close it away in a closet/room where pets cannot reach it. Not only will they make a mess rifling through all the goodies they can also hurt themselves if there are any rough objects they rifle through. Keep some rooms closed. It is perfectly reasonable for there to be certain rooms that pets may not visit unless supervised. One obvious choice would be the bathroom (remember that puppy running down the hall with toilet paper - cute - but after the 20th time said pup turns from cutie to lil'-demon). If you don't have a door to a particular area look into getting a child gate or blocking it off with other materials. If you have a mixture of pets you may not want them to be able to access certain areas of each others space. A prime example is keeping kitty litter from dogs, some seem to find the "deposits" tasty snacks. In this instance you can set up a roadblock for the dog that the cat can still easily climb over. If your pet is especially good with its nose or paws you may want to get childproof latches. They will work well to keep them out of lower cabinets in your home. Keep the lid down on the toilet, especially if you use strong cleaners. Small, curious pets may fall in and pets taking a drink can be poisoned by cleaners - some of them even contain anti-freeze! Speaking of cleaners, here are some examples of cleaners that are really dangerous to your pets (to name a few! ): ammonia, bleach, disinfectants, drain cleaner, oven cleaner, paint, rat/bug poison. Keep electric cords out of reach or secure them to baseboards. When first home keep an eye on where your pet is at all times. Some may try chewing on the cords. You can deter this with a taste deterrent like "Bitter Apple", a mix of vinegar and water, or hot sauce. Or even better, block access to them altogether. Speaking of cords, watch those drapery cords as well. Tie them up so all your window treatments aren't pulled to the ground. Many animals are attracted to fire. The light of a candle or the heat of a fireplace will peak their interest. Make sure candles are never left unattended. For the fireplace make sure Fluffy knows just how close they are allowed to get for a good snooze - warm is good, singed is bad. Keep the upstairs windows and any cellar doors shut. Young pets are just like children with their curiosity but can easily misstep and fall. Watch our for open dresser drawers, closets and other nice dark places, kittens are especially curious and many are drawn to these make-shift dens. Have you heard about the kitten jumping in the dryer? Its not a urban legend, be alert and check before you shut the door. Another warm place kittens like to snuggle is on a car engine. If your kitten has access to your car (or the neighborhood cat for that matter) it may help pound on the hood of your car and honk you horn. If you don't want to do this every day try to limit access to your car. The holidays are fun for everyone - including your pets! Decorations should be up high or in rooms that pets have limited access. Any holiday lights should be treated the same as other electrical cords. Get it out of the way or secured so your pets don't accidentally trip over them. Also keep a lookout and make sure they do not chew on them; again a taste deterrent like "Bitter Apple" will work. Other holiday items to keep from you pets include: metal ornament hooks, popcorn strands, tinsel, angel hair (it is spun glass), and decorative artificial snow or tree flocking - to name a few. Don't forget that holiday plants like holly berries, mistletoe, and poinsettias are poisonous! Fourth of July fireworks are fun for us but many pets find all the racket frightening. One suggestion is to have treats nearby and give them treats whenever there is "Boom!" so they associate the noise with happier things (mostly used for dogs). Another thing to keep in mind if you are leaving for the festivities, don't leave pets alone out in the backyard. They may panic and do things they normally wouldn't do like digging their way out! Many holidays include house guests that are not familiar with your pet or household rules. After introducing your guest to your pet, make certain you let your guests know not to leave doors open, feed table scraps or any other important household rules. If there are a lot of guests you may want to arrange a quiet place for your pet to retreat. What do they do when you leave the home? Preferably it doesn't involve eating the couch! Before you leave for a long day at work it is important your pet is calm. For dogs a good walk in the morning may be necessary. For cats a little play time will help with bonus energy. Teach your pet tricks and have them perform for you before you head out. Our pets sleep more then we do and getting rid of morning energy will help them settle for a nap while your out earning money to spend on them. If you have a really active breed you may want to look into a dog daycare or walking service for a couple days out of the week. Taking your dog to a pet daycare is like taking them to camp. They get to romp with other dogs and usually come home tired and ready for a good night sleep. Many find that a few days out of the week is enough to hold them over on the days in-between. Crates can be lifesaver when you are gone. If you have pet that is still undergoing training and is not sure of all the rules, a crate or restricted room is a must. Cautionary tale on the restricted room - we placed one of our pups in a room in our house as we went out to get a bite to eat. There was no furniture in the room except for her crate with her toys. When we came back she had climbed the crate and chewed the metal blinds on the window and also proceeded to dig up part of the carpet! Your kitchen is not only the place where you prepare your family's meals and sometimes serve them, but it is also the most widely used area in the home chosen by pet owners to feed their pets. U.S. consumers spend more than $11 billion a year on cat and dog food, according to the Pet Food Institute. And pet food manufacturers compete for these dollars by trying to make their products stand out among the many types of dry, moist, and semi-moist foods available. Pet food packaging carries such descriptive words as "senior," "premium," "super-premium," "gourmet," and "natural." These terms, however, have no standard definition or regulatory meaning. But other terms do have specific meanings, and pet foods, which are regulated by the Food and Drug Administration's Center for Veterinary Medicine (CVM), must carry certain information on their labels. Consumers can be confident that their pets are eating a nutritionally sound food if they understand the full significance of these labels. When determining your pets diet, be sure to verify that all foods have been approved by the Food and Drug Administration's Center for Veterinary Medicine. Your yard should be a fun and safe place for your pet to enjoy the outdoors, and maintaining it to prevent hazards is relatively easy. Although the outdoors may not be suitable for some pets, such as birds, mice, and rabbits, and those who stay in pens or restricted kennels/runs may not be able to enjoy your yard to its fullest extent, the tips below will address pets that have more freedom. These pets roam a fenced backyard or prowl around the perimeter of your house (i.e. small dogs & cats). Read on for a checklist of ways to make your yard safe and entertaining for your pets. When maintaining your yard you want to keep your pets in mind. When working on the yard keep pets indoors. Our dogs like to chase the lawnmower - bad idea - so they now watch from inside. Some pets may be just the opposite and try either to attack the mower or try to escape in a panic - equally bad idea. Besides the lawnmowers, trimmers, leaf blowers, chainsaws, and other loud tools should not be used when pets are around. Be careful with other tools such as shovels, rakes, spades, etc. Some pets may try to "help" you do the yard work and can inadvertently be struck by these items. Review the chemicals you use on your yard. Weed killers, bug killers/bait and other chemicals can be poisonous to your pets as well. Some you may still be able to use, however, you may need to let the yard sit for x amount of hours before letting your pets back out. Symptoms of poisoning usually include: vomiting, diarrhea and sometimes convulsions or unconsciousness. Keep your yard clean of waste. Especially with puppies, they can get in the habit of eating their waste. Besides, you will both enjoy your yard much better if it is not covered in poo mines! For cats you should have an outdoor litter box. This will be easier to clean and prevent the cat from laying waste to your (or your neighbor's) flowerbeds. Consider carefully what you plant in your yard. Plants that can cause complications include: Rhododendron, Japanese Yew, Lilly of the Valley, Peach and Cherry Trees (pits) to name a few. See our links to Poisonous Plants for more details. You may want to try to keep your yard clear of the bee family by getting rid of nests on your property. Your dog cannot escape bees flying through the yard, but cutting down their numbers may help. All dogs are naturally allergic to bee stings. Depending on the location of the sting they may have to visit the vet for medication. If it is on the mouth/head it can lead to swelling and difficulty breathing. Your pets will make your yard into their own domain. Make sure their kingdom is safe and enjoyable. Check the fence of the yard for holes or gaps that may be an easy escape. Make sure your gates are locked and secured and guests and children know to do so as well. It is best not to have any young pets around water unattended. If you have a pool or pond make sure to watch them around this area carefully. Some trainers even suggest teaching pets how to get out of the pool or pond early on, sort of a "Swimming 101" for the pet in case they get into trouble when your back is turned. If your pet does get into a pool, make sure they get a bath so none of the harsh chemicals can effect their skin and coat. Most pets are sun lovers. If your pet likes to "sunbathe" keep an eye that they don't get too hot. Signs of heat exhaustion include: restlessness, panting excessively and drooling. The worst case scenario is the pet collapsing and eventually falling into a coma. To counter it, wrap them in a damp cool (not cold) towel and go to your vet or animal hospital. In hot weather keep plenty of water. Refresh and refill it often. If you keep food outside as well make sure it does not sit too long. The heat may cause it to spoil and flies may contaminate it. Ask your vet to recommend a flea & tick prevention plan right for your pet. Depending on how much your pet is outside, where it goes, etc. you may need more preventive tools. It is imperative you ask your vet as many medicinal solutions are measured by your pets size, weight, age, etc. Your pet may like to make or find a burrow to rest in. Block off crawl spaces under sheds or decks. You don't want them to get trapped or hurt by any debris you cannot see underneath. Below are just a few ideas of things you may do to improve your yard for your pet. Placing markers around your yard for your dog to potty on or for your cat to scratch on can help save some of your other trees. Start by blocking the trees you want to save and place toys or treats by the markers you want them to use. Eventually you can train you pet to have a habitual like for that particular log(s)! Prepare digging spots for your pets. For your dog it can be a small area of dirt and sand where you keep toys to encourage him to be there. For cats you can have one container/pot with catnip or another enticement. By keeping them interested in their designated digging spot they will learn to have fun there and leave the rest of your yard alone (most of the time!). If you don't want your dog in your flower bed try a wooden or stone fence. Some dogs will learn to stay out of the area due to the road block, however you may need to supplement the roadblocks with additional training. Dogs are going to do their rounds around "their" territory. This will leave worn paths in the grass. You may want to lay a nice stone path on their route to beautify it. Continuing with a dogs tendency to make paths, for smaller yards you can make a maze path for them. Using placing flowerbeds and other structures you can create a winding route for them for their territorial routine. Pets are a wonderful addition to the family and home. Taking time to prepare your home, pantry, and yard will make both of your lives a lot easier. It may seem like a daunting task at first, however, your pet will soon learn the house rules. You may even be able to reclaim certain areas of the house as your own once your pet matures and understands not to destroy your possessions. You, too, will learn a thing or two and will begin to naturally watch out for potential pet hazards. Eventually you won't even realize your new habits. 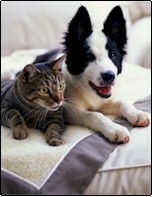 It is simply part of the lifestyle change that happens when you adjust your life to accommodate animals in your home. Just remember to be pro-active, and you'll have far fewer headaches in the long run, with great company and lots of fun! Useful Links! | Adopt a Pet | Animal Care | Dangerous Foods | Find a Vet | | Pet Insurance | Poisonous Plants | Selecting Food | | Just for Fun | Adopt a Pet AdoptAPet.com www.adoptapet.com Millions of young, healthy, beautiful companion animals are euthanized needlessly each year because there are too many pets and not enough homes or people interested in providing food, water, shelter, medical care and LOVE to these animals. Use these resources to unite animals with loving homes. American Kennel Club www.akc.org The American Kennel Club, a not-for-profit organization established in 1884, maintains a purebred dog registry, sanctions dog events and promotes responsible dog ownership. Petfinder.com www.petfinder.org Search 193,550+ adoptable pets with our advanced search or our Quick Search. Locate shelters and rescue groups currently caring for adoptable pets. Browse our resource library and learn more about how to care for your pet. Post classified ads for lost or found pets, pets wanted, and pets needing homes. Sign up to be a volunteer to help your local shelter or rescue group. Animal Care Doctors Foster & Smith Pet Care www.drsfostersmith.com At Drs. Foster & Smith we care about the health & safety of your pet. That's why we've developed this resource for pet owners like you. Healthy Pet www.healthypet.com The American Animal Hospital Association (AAHA) is an international association of more than 33,000 veterinary care providers who treat companion animals. Established in 1933, AAHA is well known among veterinarians and pet owners for its standards for hospitals and pet health care. PetEducation.com www.peteducation.com Fulfilling their commitment to provide pet owners with trustworthy pet care information, every Drs. Foster & Smith catalog contains up to 30 articles written by the doctors about the health and care of pets. Veterinary Partner www.veterinarypartner.com VeterinaryPartner.com is here to support your veterinarian and you in the care of your companion animals by providing reliable, up-to-date animal health information from the veterinarians and experts of the Veterinary Information Network (VIN), the world's first and largest online veterinary database and community. Dangerous Foods PetEducation.com www.peteducation.com - Dogs, Cats Some foods which are edible for humans, and even other species of animals, can pose hazards for dogs because of their different metabolism. PetPlace.com http://petplace.netscape.com/ Americans spend over $10 billion dollars on pet food for our pets. Despite buying the best food available, some pets would rather eat what we eat. However, certain foods can be dangerous to your pet causing varying degrees of illness. Some food is toxic due to ingredients and some by improper cooking, storage or poor hygiene. Find a Vet Healthy Pet www.healthypet.com Use Healthypet's Hospital Locator to find a veterinary hospital near you or nearly anywhere you want to go! VetLocater http://vetlocator.petplace.com/ Access to over 26,000 veterinary clinics in the United States and 2,400 veterinary clinics in Canada. Pet Insurance Pet Assure www.petassure.com Pet Assure, headquartered in Lakewood, New Jersey, is the nation's premier pet health care organization with thousands of veterinarians in 46 states, the District of Columbia and Puerto Rico. Conceived in 1996, the company mandate is to enable pet owners to obtain quality care for their extended family members, at an affordable price. PetCare Pet Insurance www.petcareinsurance.com PetCare Pet Insurance Programs start at under $10/month. It's a small investment that will help you prepare for a secure and happy life for both you and your pet VPI Pet Insurance www.petinsurance.com From unexpected illnesses and accidents to routine care for your dog or cat, we recommend the VPI Superior Plan and Vaccination & Routine Care Coverage. For those who want minimum coverage we also offer the VPI Standard Plan. Poisonous Plants American Society for the Prevention of Cruelty to Animals (ASPCA) http://www.aspca.org Please note that the information contained in our plant lists is not meant to be all-inclusive, but rather a compilation of the most frequently encountered plants. For general information on plants not included on either list, please feel free to contact us at napcc@aspca.org. Cornell University www.ansci.cornell.edu/plants/ This is a growing reference that includes plant images, pictures of affected animals and presentations concerning the botany, chemistry, toxicology, diagnosis and prevention of poisoning of animals by plants and other natural flora (fungi, etc.). Cyber Canine www.cybercanine.com/toxicplants.htm Here are some of the toxic plants you should keep away from your pets. If you suspect that your dog might have eaten any plant that might be toxic, contact his/her vet immediately. Many common house and garden plants can be toxic to animals if swallowed. The symptoms can be diarrhea, nausea, or skin allergies. Veterinary Medicine Library www.library.uiuc.edu/vex/toxic/intro.htm This database was created by Mitsuko Williams (Veterinary Medicine Librarian, 1983-2003) in order to assist the University of Illinois veterinary students in identifying common plants that are toxic to animals. This database brings together information available in library books, plants grown in the Poisonous Plant Garden, mounted specimens of plants, and the reference notes for a toxicology course (VB320) which is taught during the fall semester each year. Selecting Food Animal Protection Institute www.api4animals.org/689.htm Commercial pet food is a great convenience for busy caregivers. You want the best for your companion animals, but with a bewildering array of foods and claims to choose from, how do you decide what's best for your animals? US Drug & Food Administration www.fda.gov U.S. consumers spend more than $11 billion a year on cat and dog food, according to the Pet Food Institute. And pet food manufacturers compete for these dollars by trying to make their products stand out among the many types of dry, moist, and semi-moist foods available. Pet food packaging carries such descriptive words as "senior," "premium," "super-premium," "gourmet," and "natural." These terms, however, have no standard definition or regulatory meaning. But other terms do have specific meanings, and pet foods, which are regulated by the Food and Drug Administration's Center for Veterinary Medicine (CVM), must carry certain information on their labels. Consumers can be confident that their pets are eating a nutritionally sound food if they understand the full significance of these labels. Just for Fun Neopets www.neopets.com Neopets® is the greatest Virtual Pet Site on the Internet. With your help, we have built a community of over 70 million virtual pet owners across the world! Neopets has many things to offer including over 160 games, trading, auctions, greetings, messaging, and much much more. Best of all, it's completely FREE!